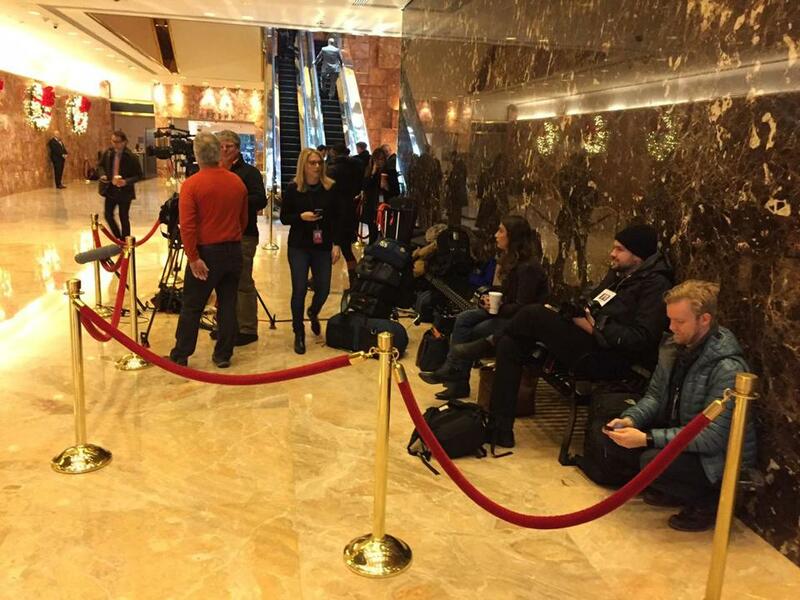 Journalists covering the presidential transition sit on a legally required bench in the public atrium at Trump Tower in December. Improbably, a 22-foot-long, legally required public bench in the entrance corridor at Trump Tower has become a prime vantage point into a new political era. That bench’s checkered history reflects decades of push and pull between public and private interests. In 1979, New York City allowed developer Donald Trump to build 200,000 square feet beyond what the zoning allowed — but only if he agreed to provide an 8,000-square-foot public atrium on street and lower levels, two outdoor landscaped terraces totaling 7,000 square feet, a passageway to public space in the adjacent IBM building, and extra retail. Under this deal, the atrium had to be open to the public seven days a week, from 8 a.m. to 10 p.m. Trump also agreed to provide movable tables and chairs, restrooms, landscaping, a waterfall, and, as drawn on submitted plans, a 22-foot-long bench across from the elevators near the Fifth Avenue entrance. For decades, the responsibility for providing urban infrastructure, once the sole domain of city government, has been shifting to the private sector. The privately owned public spaces in Trump Tower are among hundreds of plazas, arcades, and other areas that developers have built in return for permission for bigger, more profitable towers. Boston has similar spaces scattered across the city, especially along the harbor, as do San Francisco, Seattle, and Chicago. Following more public complaints, the plants were removed. Sitters enjoyed the bench for many years until it was replaced with a kiosk selling Trump-branded memorabilia. More years went by until civic activism and media pressure spurred city inspections, six hearings before the city’s Environmental Control Board, a $14,000 fine, and, finally, the quiet return last July of the bench, now made of black metal. It was a small win in an ongoing struggle to hold the private sector to its public commitments. Since Election Day, the bench at Trump Tower has played an outsized role in our democracy. Each morning, the bench fills with journalists and their cameras as they record who rides up and down the elevators to meet with Trump or his transition team. Many of these visitors come over to the bench and chat about the latest developments. The ubiquitous television shot of the elevator doors opening and closing comes from a camera placed above the bench. The public atrium in the Trump Tower became famous worldwide at the moment Donald Trump descended one of its escalators to announce his candidacy. Now, the little bench that could is serving the public interest in ways never imagined by those who sketched it on the plan so many years ago. Jerold S. Kayden is professor of urban planning and design at the Harvard Graduate School of Design and president of Advocates for Privately Owned Public Space.